An influencer. That’s what Xandre Clementsmith ’21 desires to become. But not in the brand-ambassador sense of the term. 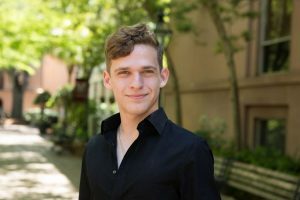 This rising sophomore in the Honors College is bent on finding ways he can make the world a better place through strategic implementation of artificial intelligence (AI). Clementsmith isn’t your average undergraduate. He’s a triple major in data science, psychology, and mathematics. He’s an accomplished musician (piano and a raft of other instruments). And, this summer he’ll be involved in two research projects – one funded by the School of Sciences and Mathematics to the tune of $4,000. Given all this, it shouldn’t surprise anyone that Clementsmith was recently awarded the vaunted SMART Scholarship, a highly competitive U.S. Department of Defense initiative that supports undergraduate and graduate students in STEM disciplines with full tuition, an additional stipend, summer internships and full-time employment after graduation. Note: Clementsmith joins fellow Honors College student Courtney Beckham ’19 as a SMART scholar. Read more about Beckham here. Initially, it was data science that drew Clementmith to the College. He’d read about CofC’s program – the first ever in the U.S. for undergraduates – and envisioned it as a vital basis for his future in AI. 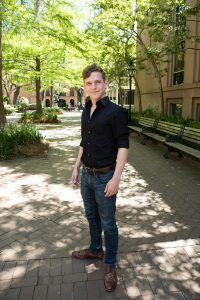 When computer science department chair Sebastian Van Delden gave Clementsmith a virtual tour of the department and its facilities via Skype on his phone, the then high schooler knew that the College would be the right choice for him. He turned down offers from several other universities and decided to make the trek east from Southern California. Since then, Clementsmith, who is an Honors College student, has immersed himself in serious study, taking 18 credit hours in each of his first two semesters. Highlights from his freshman year include winning a national competition sponsored by Wells Fargo, which culminated in a trip for Clementsmith and his teammate Jacob Mattox to San Francisco to present that project to senior analytics executives at Wells Fargo. Clementsmith is partnering with physics professor Sorinel Oprisan on research in computational neuroscience. He also became president of the Data Science Club and a student ambassador for the computer science department. And then, of course, there’s the SMART Scholarship. And it appears that the past year’s experiences have been just what Clementsmith needs given the nature of his long-range ambitions. Over the summer, Clementsmith will be traveling to Europe (his final splurge before SMART Scholarship commitments occupy his next three summers) and doing research. Along with the ongoing work he’s doing in computational neuroscience, he’ll also be working with Affonso on research in data visualization. That project, says Affonso, is likely to result in a new First Year Experience course at the College, as well as an Honors Living Learning Community. And if those things happen, then it’s clear that Clementsmith will have already begun to take on the role of influencer. Article by Dan Dickison and Photos by Reese Moore. For more on this story, check out The College Today!